Despite its mystique as the greatest Anglo-American legal protection, habeas corpus has a long history that features opportunistic power plays, political hypocrisy, ad hoc jurisprudence, and many failures in effectively securing individual liberty. The Power of Habeas Corpus in America tells the story of the writ from medieval England to modern America, crediting the rocky history to the writs very nature as a government power. This pioneering book weighs in on habeass historical controversiesaddressing its origins, the relationship between king and parliament, the U.S. Constitutions Suspension Clause, the writs role in the power struggle between the federal government and the states, and the proper scope of federal habeas for state prisoners and for wartime detainees from the Civil War and World War II to the War on Terror. Anthony Gregory stresses the importance of liberty and detention policy in making the writ more than a tool of power. Taken as a whole, The Power of Habeas Corpus in America presents a nuanced and critical view of the writs history, showing the dark side of this most revered judicial power. Misconceptions about habeas corpuscommonly understood as the legal right not to be detained arbitrarily by the governmentabound. A bumper sticker slogan critical of George W. Bushs detention policy reflects a popular myth: Habeas Corpus, 1215−2006. Contrary to this view, habeas corpus did not enjoy an unbroken streak from the signing of Magna Carta until the signing of the Military Commissions Act. Moreover, habeas corpus did not originate as an individual right against unjust detention, but rather as a courts and a kings prerogative to challenge another partys detention of someone. Habeas corpus as we know it today is the product of centuries of power struggles, and it continues to change as the result of pressures that affect our legal procedures and liberties. The paradox of habeas corpus is evident in the U.S. Constitution. Article I, Section 9, Clause 2, reads: The Privilege of the Writ of Habeas Corpus shall not be suspended, unless when in Cases of Rebellion or Invasion the public Safety may require it. Although we usually think of habeas corpus as a protection of an individual right against arbitrary government power, the Constitution made it the servant of the federal government, which alone decides whether an individual is engaging in unlawful rebellion or is justly acting against government abuses. This is one reason why, during debates over ratification, Anti-Federalists criticized shifting the authority to suspend habeas corpus from the states to the federal government. The Supreme Court decisions of the 2000s did not curtail the federal governments detention powers as significantly as many people believe. In Boumediene v. Bush (2008), one of the most controversial decisions in its history, the Court ruled that a constitutional habeas corpus right extended to the U.S. detention camp at Guantánamo Bay and that the 2006 Military Commissions Act unconstitutionally suspended habeas corpus for alien detainees held there. It found the procedures established by the president and Congress to be an insufficient substitute for judicial process, but it left open the door for them to craft alternative detention procedures. President Obamas first term yielded no real changes to the detention policies established by his predecessoryet one more example of hypocrisy in the history of habeas corpus. Military commissions, the Guantánamo Bay detention center, indefinite detention, extraordinary renditioning, and most other manifestations of Bushs detention policy were continued and in some cases expanded. The Obama administrations other radical policies, such as detention at Bagram Air Force Base in Afghanistan and its assassination of American citizens, underscore the limits of habeas corpus in restraining executive power, even when the judiciary rules against it. Yet the Great Writ, as habeas corpus is also known, did not originate as a safeguard against unjust detention. It came to play that role after centuries of struggle among English governing bodies over who possessed the authority to detain a particular individual. Even today, in post-9/11 America, habeas corpus proceedings reflect the prominence of government power above the principle of liberty. 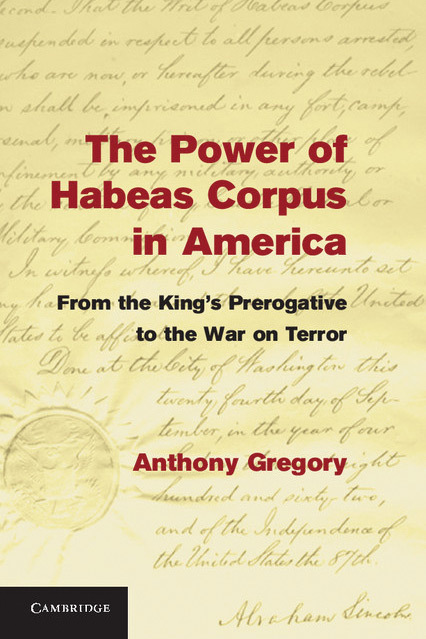 In The Power of Habeas Corpus in America, Anthony Gregory tells the story of the writ from medieval England to modern America, crediting the rocky history to the writs very nature as a government power. The book weighs in on habeass historical controversiesaddressing its origins, the relationship between king and parliament, the U.S. Constitutions Suspension Clause, the writs role in the power struggle between federal and state government, and the proper scope of federal habeas for state prisoners and wartime detainees from the Civil War and World War II to the War on Terror. The concluding chapters stress the importance of liberty and detention policy in making the writ more than a tool of power. The book also includes appendices that examine U.S. Supreme Court decisions made during World War II and the War on Terror. Taken as a whole, The Power of Habeas Corpus in America presents a nuanced and critical view of the writs history, showing the dark side of this most revered judicial power. Habeas corpus arose and evolved in response to struggles between competing interests. In medieval England, courts had long been decentralized and did not attempt to compel obedience. Centralized royal courts were introduced only after the Norman Conquest in 1066, and although overlapping and competing jurisdictions were common, legal procedures became more uniform. Courts issued various kinds of writs of habeas corpus to compel sheriffs, witnesses, and juries; and writs that scrutinized detentions and liberated the wrongly detained arose from higher courts asserting their authority over lower courts. Parliaments role is widely misunderstood. Its limiting of royal power to detain was motivated less by concerns for individual liberty than by a desire to secure its immunity against royalty and to augment its own power. On numerous occasions it dispensed with habeas corpus protections that obstructed its own agenda, and it revealed itself to be as much a menace to freedom as royalty had been. The American colonists viewed habeas corpus as one of their common-law rights as Englishman, but they interpreted this tradition selectively. Emphasizing its purest pro-liberty element, they copied portions of Englands Habeas Corpus Act (1679) and affirmed their understanding through legal decisions and legislation, but they ignored the centralizing role that habeas had played in England. Once the revolutionary war began, some champions of habeas discovered that it interfered with their own priorities. Virginia, for example, suspended habeas for traitors to the revolution. After independence was won, states embraced habeas in their common law, and some eventually made the writ irrevocable in their constitutions. The American understanding of habeas corpus seemed like a settled matter. With the adoption of the federal Constitution, however, the decentralized, revolutionary conception of habeas corpus met an enormous and ultimately overwhelming challenge. The Suspension Clause transferred the ability to suspend habeas corpus from the states to the new central government. As Anti-Federalists had warned during the debates over ratification, the clause eventually transformed the American version of habeas corpus into something that resembled the British one, a writ to be imposed from above. But even at the state level, habeas corpus was not a consistent protector of individual liberty, a fact especially evident in regard to slavery. State habeas writs were used both to undercut slavery and to defend it. In the North, habeas corpus occasionally freed slaves or blocked their return to the South. In the South, slave owners used it to bring escaped slaves back under their control, and slaves habeas corpus rights were subordinate to the property rights of their owners. The Civil War revealed that the federal government was no more reliable in using the writ as a tool of freedom than were the states. The Lincoln administration suspended habeas corpus, arrested thousands of citizens in the North and South, subjected civilian detainees to military commissions, and enforced martial law. Although the dominant view until then had been that only Congress, not the president, possessed the authority to suspend habeas, Congress raised no objection when Lincoln affirmed this power as his own and even passed a law that indemnified him. The courts proved inadequate to stop the executive encroachment. Despite Ex parte Milligan (1864), a Supreme Court decision that invalidated military tribunal convictions when civil courts were feasible, military tribunals continued well after the war. The Habeas Corpus Act of 1867 gave federal courts habeas review powers of lower and state casesthe better to protect blacks from state oppression and enforce national policy in the South. The moment that habeas corpus came into conflict with the priorities of Reconstruction, however, federal politicians worked to curb federal habeas review of federal cases. Reconstruction brought about the full nationalization of habeas corpus. With its decision in Tarbles Case (1871), the Supreme Court stripped the states of their authority to use habeas against federal detention. Over the course of the following decades, law enforcement grew increasingly federalized and new threats to the liberty of detainees emerged. Prosecutions under the Chinese Exclusion Act (1882) were often challenged on habeas corpus grounds, and courts usually ruled in favor of the petitioner. The 112,000 Japanese-Americans interned in detention camps during World War II had no such luck, and two Supreme Court decisions related to this bleak episode in habeas history are among the cases examined in detail in the books appendices. After the war cases were resolved, federal habeas corpus controversies refocused on the scope of federal review of state detentions. In Ex parte Hawk (1944), the Court broadened federal scrutiny, and Congress codified this new standard in 1948. Later decisions expanded the scope of federal review, especially under the Warren Court and to a lesser degree under the Burger Court. The Rehnquist Court, however, oversaw a shift toward a narrower scope for federal review. Legislation passed in response to the Oklahoma City bombing reinforced this trend. The executive branchs response to the terrorist attacks on the World Trade Center and the Pentagon renewed interest in habeas corpus. Among the old issues that gained new significance were the questions of whether habeas guarantees apply to all government detainees, whether national emergencies give the executive branch special powers, and what constitutes a valid suspension of the writ. The post-9/11 hunt for terrorists and collaborators in the United States quickly netted more than one thousand people, mostly immigrants, who were denied due process. The USA PATRIOT Act, passed in October 2001, authorized the government to detain suspected terrorists without charge for seven daysor virtually indefinitely, so long as every six months it deemed them a national security threat. Most detainees were released within one year. The treatment of American citizens John Walker Lindh, Yaser Hamdi, and Jose Padilla revealed further limitations of conventional due process procedures. Those deemed enemy aliens had the fewest legal protections. Treatment included military tribunals without Geneva Convention protections, the depredations at Guantánamo Bay and Abu Ghraib, and enhanced interrogation. Dozens, and perhaps several thousands, underwent extraordinary renditioning to countries that practiced harsher methods of interrogation. In 2004, 2006, and 2008, the U.S. Supreme Court issued controversial opinions that reduced executive detention power. Each decision, however, contained conciliatory elements and even guidelines on how to circumvent meaningful habeas review. Ultimately, the Court decisions did little to weaken the authority claimed by the executive branch. President Obama, having campaigned in 2008 to close Guantánamo, gutted the impact of the Courts rulings, both in their narrow victory for the detainees and in their broader meaning for detention policy. The mixed legacy of habeas corpus invites a reassessment. Scholars have long argued about what habeas corpus has always meant, and all sides make valid technical points. Lost in much of the discourse is the essence of the Great Writ, a meaning whose radical implications even many of its devotees have not yet considered. Habeas has been an imperfect remedy against tyrannical imprisonment, one badly in need of a justifying principle. For those who wish for individual liberty to triumph over the abuses levied by executive detention and the modern criminal justice system, the advocacy of certain concrete reforms is necessary but hardly sufficient.